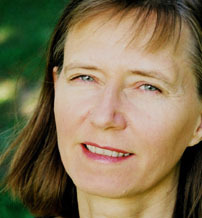 Irene Sjögren was born in 1953 in Stockholm. She grew up in a family in which everyone was active musically. Irene began singing jazz already in her childhood but later on, instead of choosing a musical path, she decided on a university education in mathematics and physics. After doctoring in elementary particle physics she continued for ten years in research at the Karolinska Institute in a group which studied the intricacies of the human brain. After these years of scientific activity she once more turned to music and has for the past ten years been teaching jazz singing at the Royal College of Music in Stockholm. In the 1970s she began singing in choirs and as a soloist with different big bands including some of the most prominent in Scandinavia. In the years 1983-84 she was invited to collaborate with the legendary Thad Jones both in big band and small band situations which included a radio programme from Copenhagen with the Danish Radio Big Band. Parallel with her big band activities Irene Sjögren has also worked with various small groups often in the company of her partner, pianist Ove Lundin who is also a teacher at the Royal College of Music in Stockholm. In 1983 they started the Irene Sjögren Quintet together with Olle Steinholtz, bass, Pétur "Island" Östlund, drums, and Gustavo Bergalli, trumpet. Saxophonist Johan Alenius later joined the group. They played at jazz clubs around the country, jazz festivals - including the Skeppsholmsfestival in Stockholm, and performed on the radio. In 1986 they recorded an LP, "Sweet Surprise", for Dragon which received very enthusiastic reviews in the press. Nowadays Irene works mostly in a trio format with piano and bass. This intimate combination has now been recorded on CD for Touché with the title "Song For A Willow", and Gustavo Bergalli adds his masterful trumpet on four titles. Commenting on her unusual background in the world of science Irene says: "My experiences as a physicist are always near at hand and to a certain extent influence my relationship to music on the more philosophical plane. My conception of time and space, things large and small in the universe, laws of Nature and symmetry, a deeper understanding of the overtone system, the unlimited resources of the brain, all these things contribute towards my conception of performing music. In purely practical terms it is of great help, not least when I am practising, that there is a systematic, methodic and logical streak in me. I also feel as though there are many parallels between a research environment and that of the creative musician. But, that which is unsurpassed in music, as in all art, is of course the emotional aspect, to be completely true to your feelings at every moment and at the same time experience the holistic exchange of information which the music provides."